Today turned out to be a day of two halves and, the paradoxes and contradictions contained within it, neatly embodied the spirit and ethos of endurance rallying. We began in Chile and finished in Peru. We awoke at sea level and slept at 2300 m. We ran along a spectacular traffic free coastline and climbed through the high Desiertio de la Clemesi. We passed sleepy fishing villages, vast bird sanctuaries and mighty industrial complexes. We had a test that was on a track set in a sandy wasteland. The second was set in a busy urban environment. From the massive and overwhelming dry rocky desert, sprang oases of fertility comprising rice paddies, fields of potato, onions and garlic. In short it was a fascinating journey. As the reveille bugle sounded though, the early start we'd been warned about came around. Today we were due to cross from Chile to Peru, the last border crossing of the Rally and, as any passage through an international frontier, it did tend to concentrate the mind and sharpen the senses. For most of us that is. There was one crew, who shall remain nameless, who had a narrow escape even before they’d left Chile thanks to the sharp eyes of Mark and Colin Winkelman. The ever attentive Porsche crew found the paperwork (carnet, passport etc) belonging to another car fluttering in the breeze. It had, it seems, been left on the roof of the car while they were refuelling and they’d driven off without it. 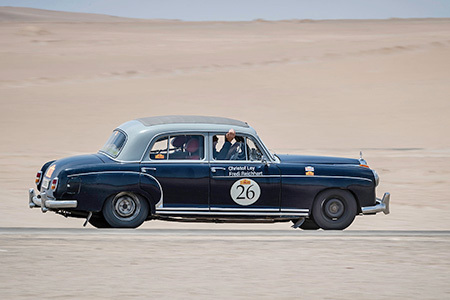 Once everyone was accounted for and safely through the border, the first test of the day roared into life at the Autodromo Tacna which was, according to Fred Gallagher, the world's friendliest circuit. Certainly the track staff and marshals were looking forward to our visit having laid on music and a free bottle of Pisco for all. Early arrivals, Paul Carter, Vincent Fairclough and Lars Rolner took the time to walk the circuit before driving it and were seen sagely rubbing their chins and sucking their teeth. They certainly looked as if they meant business and in the event they certainly put on a good show for us, with forearms tensed, wind in their hair, sweat on their brows and on opposite lock they set the track alight. The two laps of this spectacular desert piste also fired up the rest of the crews and there was much excited chatter in the paddock after they'd taken their turns although after pulling back into the pits, Garry Boyce and Ken Williams needed a bit of help from Andy Inskip and Tony Jones to get their Mercedes Benz going again. Following this track time it was straight back to the main road and, via a quick customs check some 55 km up the road, we began the stunning drive detailed above. Our first port of call was the Passage Control in Corralitos and then onwards to the lunch Time Control in El Fiscal where crews dined on emapandas under a fresco of the last supper. The Puente Freyre, over the Rio Tambo is where we finally turned away from the coast and began our climb inland through yet more impressive scenery and it was here that we spotted Serge and Jacqueline Berthier’s equally impressive Jensen Interceptor by the side of the road. The gearbox had failed and despite the best efforts of the sweeps it was left to Charlie Neil from Cars UK to arrange its collection and delivery to the hotel. 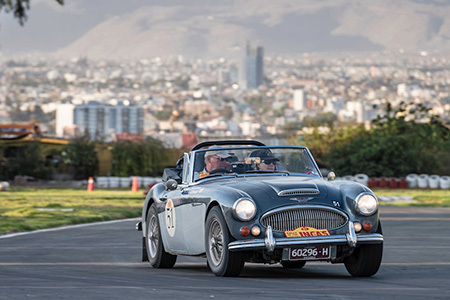 The climbing continued and, slicing through the trucks and buses heading into Arequipa, we arrived at the final test in the Kartodromo Mostajo which was at 2300 m. This facility could best be described as compact, or as Layne Treeter put it, ‘a driver training school’. Such an arena was obviously not the natural playground for the Bentley Brigade but it was the ideal habitat for the smaller more agile machines such as our four Porsches. Joost van Cauwenberge was all adrift - as usual whilst Brant Parsons quipped that it ‘was a real tight one for sure’. Gavin Henderson and Diana Henderson are safely back with us after their short absence and are looking to wrestle their way back to at least the third place they held before Marco Halter and Claudia Engelhardt snatched it from them on the way to the Altiplano. Today, on fresh tyres the Porsche looked to be relishing the challenge. There’s a two hour time difference - the wrong way - between Peru and Chile which meant that there were some sleepy crews looking to get an early night this evening. Tomorrow we’re off to Lake Titicaca.